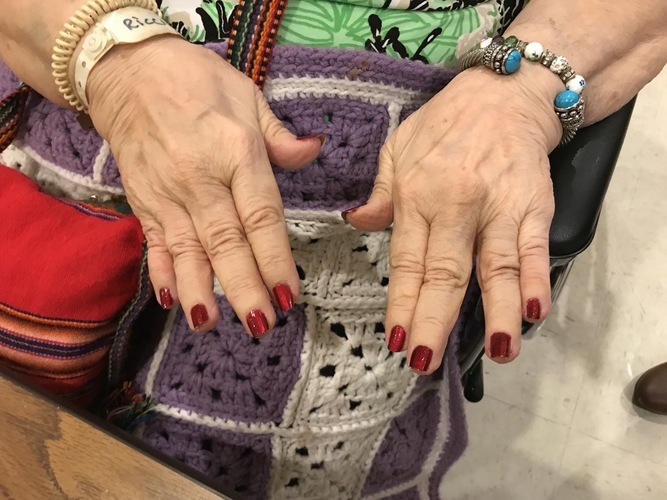 Today's blog is by GG Volunteer Alexis, who came to an important realization while painting a seniors nails-- for the third time. Read how Alexis came to realize that kindness and conversation is the most important part of GlamourGals. Coming to the makeover today, made me realize how important GlamourGals is. These ladies wait on us and really care if we are they or not. At first I thought they just liked getting their nails done. But now I realize that sometimes it’s all about the conversation for them. I was doing Josephine’s nails and she kept making me change her nail color. I would paint her nails, and she would go on saying how much she loved them. Then, a few minutes later when I went to go help another lady, she told me that the color we picked really wasn’t suiting her.The third time repainting her nails, I saw how she only wanted to speak to someone. She told me how nice it was when we were talking and how she loved getting her nails done. At that moment, I realized I just had to take my time with her and let the conversation take its time. At the end of the day, all she really wanted was someone to listen to her and her stories. Josephine is a wonderful lady and she taught me how important it is to listen and converse to others even if they don’t seem like they want to talk to me. Leaving the nursing home, I realized how theses ladies have enough quiet in their lives, and when they see us they should have the chance to share their stories and experiences.